Free standing shades and weather protection solutions are frequently required when there is little or nothing to install an ‘extension’ type product to. In many areas requiring outdoor shade or weather protection, such as a large courtyard or L shaped section at the rear of a property we encounter varying eaves heights for the roof and guttering making extending out from the building impossible. Quite often many older properties have already been extended with a single storey onto, or coming off from a double storey, and this means we don’t have the necessary height or fixing points for a sizeable canopy or retractable roof system to be specified. Samson offer a large choice of free standing solutions, from a centre pole umbrella through to a stand alone ‘Med Room’ type system, which effectively is a complete outdoor room with a single or multi part retractable roof system and built in rainwater guttering and various options for closing some, or all the open sides up with vertical blinds, sliding glass doors, etc…. All our systems are made to order and in almost any shape, colour or size too. Choose from the 6 categories of products. ‘Butterfly awning’ is a generic term used for traditional retractable fabric awnings on a goalpost frame system. These offer free standing waterproof weather protection system and are the ideal solution to cover large areas as a self supporting structure. 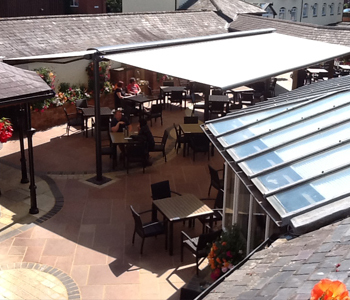 Due to the fact this unique type of terrace cover requires very little support space, it is the ideal solution for many pubs, clubs, restaurants and other premises which require coverage over a large outdoor space but have many obstacles in tight spaces such as in many London properties. As much space is needed as possible on the ground whilst as much cover as possible is required overhead. 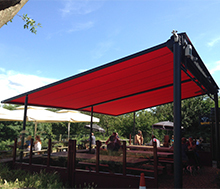 A Butterfly Awning terrace cover is also a practical product for large home patios, pool sides, pub gardens, restaurant terraces or schools and nurseries due to their low surface fixing area requirements. At its maximum size the Markilux Syncra will cover 48 square metres at 6 metres long with two 4 metre awnings projecting at opposite sides. 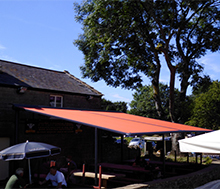 All Butterfly awnings are custom made to individual requirements from a 3m x 3m unit up to the 6m x 8m maximum coverage and larger when units are ‘coupled’ together. The Syncra is the most robust butterfly awning system in the UK and is perfectly suitable for light to medium rainfall and depending on the awning a good wind resistance too. Beware of many lower quality and flimsy butterfly awning systems which are only really designed for calm winds and sun shading only. The aluminium framework structure support is concreted directly into the ground or uses a very large plate to fix to a concrete pad. There is also a Syncra ‘Flex’ which enables a non fixed version using 2 large steel boxes for each support leg and these are filled with ballast and then used as a seat or flower box but provide the proper support for the framework. This means with a bit of effort they can be moved if required to a different position. The framework is available in 5 colours as standard but can be powdercoated to any other RAL colour on request. 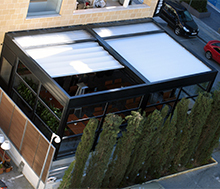 The pitch of the various awning options can be adjusted from 0 to 35 degrees. 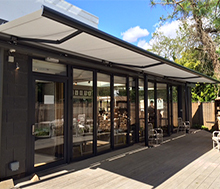 A Markilux Syncra uses 2 independent awnings enabling more control of the cover, one awning fully out and the other closed and so on. Heating & Lighting Systems can be easily incorporated into a Butterfly Awning system for added comfort in the colder months and darker evenings throughout the year. The operation of a Butterfly Awning is either manual or electric remote control operated with extras such as wind and rain sensors available to ensure it cannot be accidentally left out in bad weather by mistake. There are over 200 fabric colours to choose from to ensure the enhancement to the surrounding area. View our awning materials section for more information. 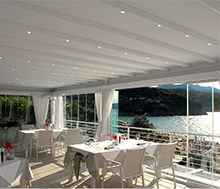 The Syncra Uno is a perfect solution to provide any of the retractable fabric awnings for a building when there is nothing substantial to fit to or too many obstacles. 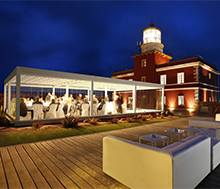 It is the Syncra frame system with the in ground fixture or the surface mounted ballast boxes to provide stability and then a choice of any of the Markilux awnings up to 7 metres wide in one section. 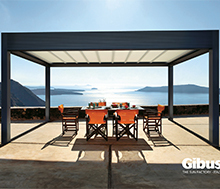 Maximum projection for a retractable awning is 4 metres and this is limited to a few models only. 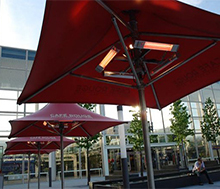 The Samson range of commercial umbrella systems is extensive with solutions from a quite small 3m x 3m up to a massive 8m x 6m. Cantilever Side-Arm Umbrellas are supported by a cranked arm which sits to the side of the umbrella. 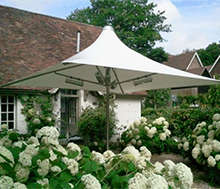 This gives a contemporary design look whilst also providing maximum shade underneath the umbrella. 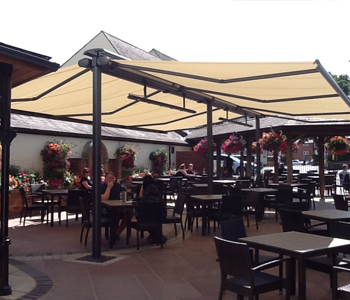 Care has to be taken in any exposed and windy position with this type of umbrella at all times, it is best suited to a sheltered area for sun shade use in the main. Centre Pole Umbrellas are your more traditional umbrella. 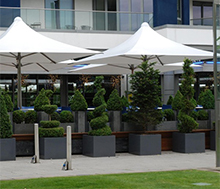 Supported by a pole erected in the centre, a centre pole umbrella can extend over large distances to offer high levels of shade. The base fixing is very important once you get to sizes above about 3m x 3m. There really is only one commercial umbrella if you want an umbrella that has been tested to 100km/h!! The Vortex has it all – Good looks with the high grade stainless steel framework – Super strong thanks to years of design and a very tough vinyl cover – Large choice of colours and base fixings to suit every application. The Vortex is an umbrella that you really can leave out for pretty much all year round performing as an excellent and large promotional banner for your business as well as providing shade and rain cover for your customers in every weather that anyone would want to be outside in. The term ‘Large Umbrella‘ is not just a gimmick – our umbrellas are really that big! 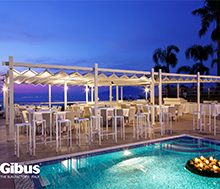 Reaching astonishing sizes of up to 50m² in a range of breathtaking designs from award winning manufacturers May, our giant parasols and large umbrellas can meet your size and design needs. As well as the large sizes available some of these larger umbrellas are tested up to gale force 8 wind speeds. This is essential when looking to purchase an umbrella – more so in the United Kingdom with the unpredictable British weather. We offer various shapes such as square, rectangular, octagonal or even inverted for trendy cafes or nightclubs. Logo’s and company branding can be added to these umbrellas to give your company the perfect commercial image to draw your customers in. Stylish side valances or even full length side walls are available. This offers wind and sun protection from various angles. When more than one unit is used they can in fact be attached using a simple zip connected rain chute to channel water away from the covered area to create a super umbrella. 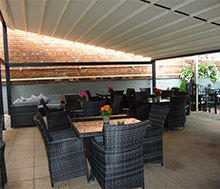 We have various self supported pergola type systems offering large retractable roof protection with varying degrees of rainwater control from just throwing the water off one or 2 sides to complete control and capturing of the water with built in guttering systems, enabling the water to be directed away from the covered area. Like the Vortex and Pergotex systems the cover fabric is one of the most important elements when supplying a commercial system needing to keep paying guests dry and happy. So many umbrellas and awnings, even with waterproof fabrics, won’t have the necessary strength to take the weight of water in a sudden downpour, leading to stretching and damage ultimately. The very tough and thick PVC fabrics used in our enhanced pergola systems ensures rain won’t get through in any way whilst the fabric strength is far higher. The Isola Fly system offers an aluminium self supporting framework creating a pergola effect whilst a simple concertina style PVC cover is retracted in and out as required with the rainwater draining off 2 sides though the arched design in the cover. Stainless steel components join the sides and produce the pantograph mechanism. The system can be operated by means of a manual crank or Somfy motorisation with RTS remote control activation or IO-Homecontrol. The system is secured to a prepared suitable ground surface with a foot plate for each vertical support. A different take on free standing shades, the Med room has a stand alone option in the various models of outdoor rooms we provide. 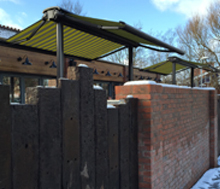 Based on an all aluminium structure with built in rainwater guttering and a framework system capable of supporting any option for enclosing the sides this really is an all year round solution for both commercial and domestic applications. Create a beautiful and exclusive stand alone ‘outdoor room’ using existing outside area with the flexibility of opening up the roof and sides in finer weather. All Med Rooms are bespoke in size, colour, height and all the various options for the roof and sides. With the right lighting and heating specified you can have use of the additional outdoor space for most of the year round. The 100% waterproof PVC roof covers can have LED lights built in and will feel like a normal ceiling when closed but open fully in the sunshine and warmer months with wind protection coming from the side elements when the air cools down. Complete control of the weather. 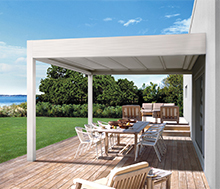 The new bioclimatic Med Twist pergola system is an ideal solution for outdoor living, bringing maximum comfort with minimum energy expenditure, providing a unique and natural feeling underneath at any time with complete control at your fingertips. A solid, 100% waterproof roof one minute and then an airy open vented roof system the next with control of the fin angles to give shading at al times of the day. 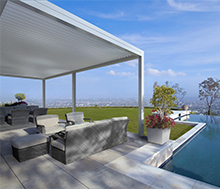 Thanks to two innovative patents, Twist Motion and Side Seal, the new bioclimatic terrace cover system acts harmoniously on the aluminum supporting frame structure, brings out its elegance and personality and increases its efficiency. The area underneath becomes an area you can thoroughly enjoy in complete tranquility with the reassurance of 100% water resistance when it is raining. The metallic tilting blades that make up the cover are fixed laterally by means of stainless steel pivots. They have a patented rotation movement (Twist Motion) and can move from the horizontal closed position to the open one with an angle from 0 to 135 degrees. The movement, driven by an invisible linear motor on the outside with remote control, allows the blades to rotate in such a way to regulate the microclimate of the environment underneath and to provide efficacious protection from sun and rain. 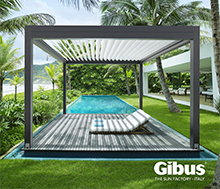 Slightly opening the blades gives you the benefit of a natural and pleasant ventilation, while, directing them in a way that screens sun and light, you can enjoy total sun protection, which lets you experience the space in total safety. Internal insulation of the blades is possible in order to block out the noise of rain, with a noise reduction of 70%. Elegant and perfectly functional in any angle, the Med Twist bioclimatic pergolas offer an exclusive opportunity for outdoor living and entertaining, the pleasure of creating and controlling the climate of your environment and of enjoying it in complete freedom, in any weather.